Apologies for my extended absence, but I'm still getting over a bout of viral pneumonia that put me out of commission for most of the past three weeks. From what I'm seeing on other people's blogs it looks like this or something milder but similar has been making the rounds all over, and it's been no fun at all. I still feel like crap, I still have to take six different medicines to combat all the symptoms, and I'm still hacking up large quantities of phlegm at highly inopportune moments, but I'm in better shape than I was a few days ago. As soon as I'm back to fighting strength...I'm still going to be on a reduced blogging schedule for a while. I fell way behind schedule on all my assignments while I was nonfunctional, and I'll need to make up for all that lost time as quickly as I can. It's a full plate waiting for me, once my appetite comes back. I sincerely believe Marc-Oliver Frisch has discovered precisely where mainstream comics went wrong this year in this collection of particularly telling quotes. Can you spot the common theme? Jim Shelley offers a year-ending recap of The Top Ten Digital Comic News Stories of 2007. People could spare themselves much frustration in life if they'd just broaden their horizons and try to learn about something beyond their own narrow field of endeavor. The comics industry seems determined to repeat every single mistake made by the recording industry with regard to digital distribution because they never bothered to find out how poorly those strategies worked out for the record labels, who are in the process of retreating from subscription models and onerous DRM even as we speak. The Fortress Keeper writes the rebuttal I would like to have written if I had the strength and if I'd seen the offending lazy remark in the first place. Have an excellent New Year, folks, and I'll be back when I'm up to it. With Christmas shopping in full swing, and inspired by a discussion with Jon K over at Jon’s Random Acts of Geekery, here are some pictures from the Big Jim’s P.A.C.K. line of toys featuring box art by none other than Jack Kirby! Ah yes, those were the days...back when Mattel made high-quality merchandise and didn’t expose children to high quantities of lead from Chinese factories. Or if they did, we were none the worse for it. 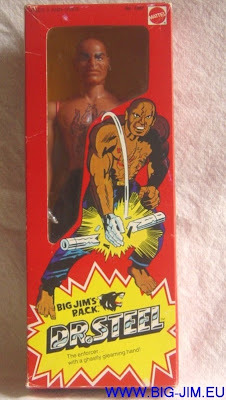 I played with Mattel toys like Big Jim all through my childhood and it did me no harm whatsoever, other than an uncontrollable urge to eat paint chips. Obviously these boxes have no art credits, and other artists did the packaging for later additions to the line, so precise attribution is a matter of opinion. However, looking at these I feel pretty confident in asserting these four boxes are the ones Kirby drew. Compare them to his published comics work of the same period (say, his last few issues of Kamandi) and you’ll see the same techniques and even the same drawing errors! Kirby did a few other art jobs for Mattel prior to this, and about a decade later produced some designs for the Kenner Super Powers toy line. In all likelihood Kirby could have made better money doing this kind of work full-time than he did in comics, but Kirby saw himself as a storyteller -- essentially, a writer who just happened to draw the stories he wrote -- rather than a commercial artist. Looking at comics from 1975 or 1976 you may come across this ad for the toy line, sometimes mistakenly attributed to Kirby but actually the work of illustrator William Stout, who rendered it in a Kirby-derived style after asking the King’s permission.